3 women (Jill, Anne & Mary) and two men (Jeff & Phil) met at Walberton Pond on a clear but cold morning to tackle the challenging ride to Newbridge and back. The temperature rose slowly as we rode, but it was still jolly cold when we stopped for coffee at the RSPB at Pulborough Brooks having followed the usual route out through Amberley and Rackam. Our leader decided to try the off-road route due north from the RSPB turning at the White Horse and following the road across the A29 to eventually pick up the bridleway to cross the river by the old stone bridge. The bridleway was passable - on foot - but the four bikes were caked with sticky mud by the time we reached the main road near Wisborough Green, and we had several stops to clear the mud from mudguards and pedals during the rest of the day. Turning right at the main road, we soon reached the Limeburners where a large Horsham group were already on their second round of drinks and starting into their food. We ordered ours and exchanged pleasantries with the Horsham group. After lunch, we returned to Wisborough Green and then took the minor road over the hills to Fittleworth, taking care to avoid the low-flying owls as usual. From Fittleworth we headed in a slightly round-about way to Bury where we stopped at the tearooms for afternoon tea. We then headed across to climb Houghton Hill to Whiteways and then on to the spur where we parted company with Anne and Jill returning via Barnham, and Mary, Phil & Jeff heading down the main road to Eastergate. destination for us. We crossed the Littlehampton footbridge for lunch by the river at the Look and See Centre cafe which was very pleasant. We returned home via Yapton, Walberton, Aldingbourne and Tangmere. It was good day out for this time of year. Saturday 21 January. 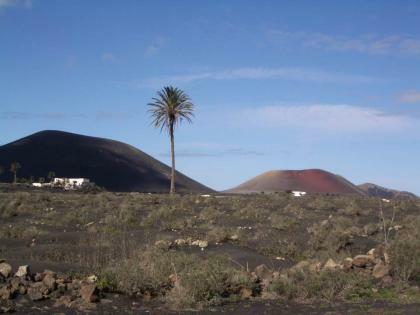 Lanzarote. Club Ride to Teguise. On Wednesday Alan and Liz flew out to Lanzarote for 2 weeks staying at a resort further up the South East Coast from me of Costa Teguise. Today I cycled over there to join them for a ride. Weather was warm and sunny with scattered light clouds. Temperatures reached 21C. I had a 17 mile ride over there with a 1000ft ridge to climb and we met up at Alan and Liz’s Apartment. After a visit to the shop to sort out a problem with Alan’s hired mountain bike we headed inland on a quiet gentle climb. We cycled under the main road at about 500ft and then headed north east parallel to the main road on the old road which had no traffic. After about 2 miles we turned off on a byroad towards Teguise via the village of Teseguite. We circled the base of an old volcano crowned by the castle of Santa Barbara. We came out just above Teguise at 1100ft. We then had a short descent into the back alleys of the old town where we found a restaurant for lunch. In the afternoon we had a good descent on the main road to the town of Tahiche with views towards the mountains to the south. 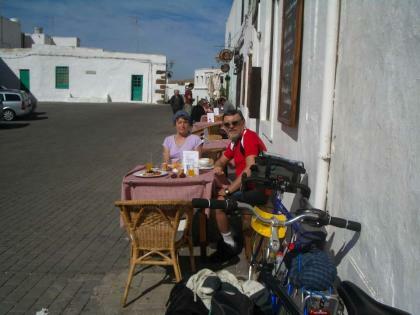 Here we split up with Alan and Liz heading back to Costa Teguise and I headed back to Puerto del Carmen. My mileage for the day was 47 with about 2500ft of climbing. Thursday 19 January. Lanzarote. 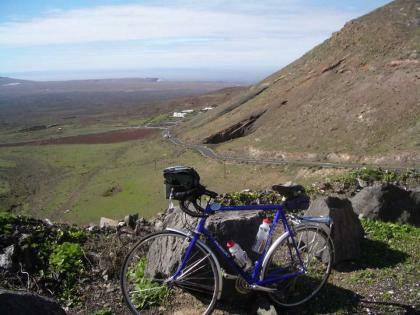 El Golfo Crater and Femes Ride. I planned a shorter ride today after yesterday’s exertions. Weather was bright and sunny and very clear although it clouded over later in the day. Temperatures rose to 20C. I headed southwest to start with on the Playa Blanca road via Yaiza which involved a climb to 750ft. Then I turned off on a quiet byroad across lava fields where the lava had flowed down from the multiple eruptions to the sea. 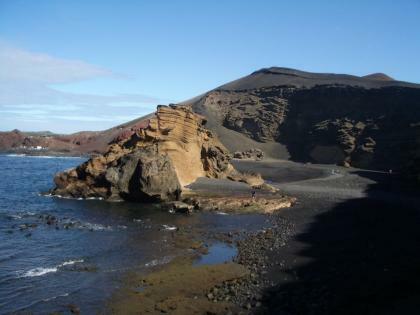 I went down to view El Golfo Crater which is a volcanic cone eroded in half by the sea. The road then continues a circuit along the coast on dramatic lava cliffs pounded by the sea. I saw on the route a big group of disabled cyclists on 3 wheel hand powered recumbents. 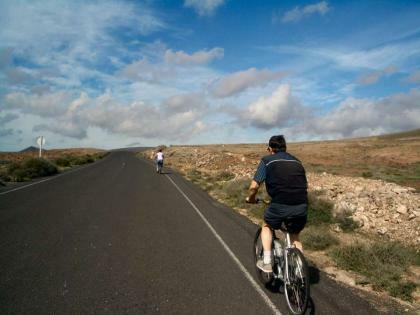 I passed under the main road and climbed up to Las Brenas and then further up with great views down across the plains on the southern tip of the Island to Playa Blanca with the hills of the Island of Fueventura visible in the distance. 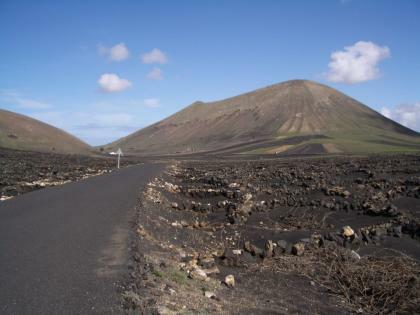 The byroad comes to a roundabout where it joins the mountain road route coming up from Playa Blanca. From here the road heads skyward up a cliff with gradients of about 15% for a mile. On top of the cliff is the village of Femes where I collapsed into a restaurant for lunch dripping sweat. I soon recovered to appreciate the great views from the terrace at 1250ft. The road from Femes back to the main road had been recently resurfaced which made for a great fast descent. Mileage for the day was 36 with about 2500ft of climb. Wednesday 18 January. Lanzarote. Tabayesco and La Nieves Ride. Today was a little different for me from the usual short and easy Club Wednesday ride. Weather was sunny with some cloud and temperatures reaching 19C. I headed up the byroad to Tias and then on to Conil and Masdache on the central plateau. Then on the main routes but still fairly quite roads to San Bartolome and Tahiche. Here I joined the LZ1 coast route headed north east. This road had recently been replaced by a new road leaving the old road as an access road. I took this and there was so little traffic it felt more like a road width cycleway. After 10 miles I turned off the main route on a byroad via Tabayesco which wound its way up a valley for a 1200ft climb to come out near Haria. Near the bottom of the climb I was passed by a group of 4 German Cyclists out training. 2 speeded ahead but I managed to stay with the other 2 which made for a good workout. Near Haria the byroad joined the main Haria to Teguise road which hairpinned its way up for another 800ft of climb to the pass at 2000ft. At the top of the pass I turned off on a byroad to the viewpoint and Church of La Nieves. 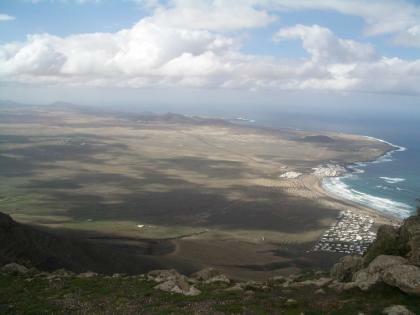 This has one of the best views on Lanzarote looking down from 2000ft cliffs to plains along the North West coast. 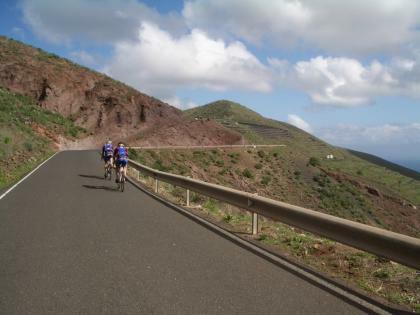 I continued down to Teguise on the main road which is a great smooth surface making for a fast descent. Then back to base via San Bartolome and Tias. 54 miles for the day and about 4000ft of climbing. Sunday 15th January. Lanzarote. Circuit to Mount Tarnia. Weather started cloudy but soon cleared to sunny skies. Temperatures reached 20C. After hard rides the previous two days I undecided on a shorter ride today. I took a minor road up to Tias and bypassed the town to the west taking another minor road under the Motorway and then further up to the village of Conil. A little above the village I came to the high point at 1180ft. I was now on the high volcanic plateau in the centre of the Island. The landscape was harsh and rocky but I spotted one tree with the red cone of Caldera Colorada in the distance. I continued to the main Uga to Teguise road at Masdache. There was little traffic on the main road but I turned off it to head further north towards Mount Tarnia. This byroad was carved out of the rocky lava sheets. Near the base of Mount Tarnia I turned off on another road to El Islote and then back to Tias on byroads. 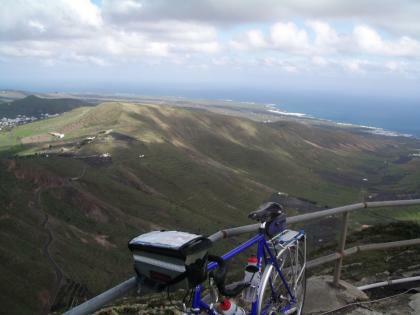 I had a fast descent on the main route back down to Puerto Del Carmen. Mileage for the day was 22 with about 1500ft of climb. Sunday 15 January. Lanzarote. There are Trees!